In one of the week’s more bizarre stories, a former beauty queen whose protest against a pageant’s skewering of the #MeToo movement has been disqualified from a number of recent trail ultramarathons and ejected from the U.S. Skyrunning team for cheating. Maude Gorman, 24, who claims to have been a victim of sexual violence at age 13, forfeited her Miss Plymouth County crown last month after observing a skit at the Miss Massachusetts pageant that poked fun at the #MeToo movement. Her protest went viral. 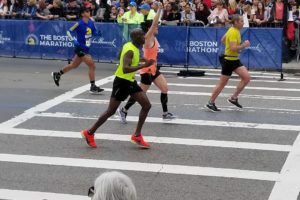 Marathoninvestigation.com has reported that meanwhile, several ultramarathons Gorman participated in this summer have disqualified her for cutting courses. Gorman finished second in the 50 miler at the Pineland Farms Trail Challenge of New Gloucester, Maine in May. She has since been disqualified for cutting the course at least twice and refusing to submit her Garmin data when questioned. Gorman has also been DQ’d from the East End Trail Races 50K in Easton, Massachusetts, which took place August 5, and where she claimed a result as first female. Canadian runner Polina Lepniakova of Ottawa, Ont., has been named the rightful winner.